Jim Kirwa"Israel continues its heavy bombardment of the Gaza Strip despite talk of a looming ceasefire. A barrage of Israeli shelling hit Gaza overnight, (1-16-09) with Israel claiming it struck forty targets. Twenty-one days into the Israeli attack, more than 1,100 Palestinians have been killed and more than 5,200 wounded. At least 700 civilians are among the dead, including more than 350 children. Much of Gaza is without food, water and electricity." In this illustration parts of our real problem are clearly shown. The space at the core of the Israeli star contains what happened to the former USA, and describes what America has finally become. We've lost the olive branch that was in the claw on the left, and replaced that with missiles and bombs. We've wrapped the eagle with a bandolier of bullets and lost the Latin phrases that the eagle once held; replacing them with the 'Deceptions & Lies" that now determine virtually all US policies in both the world and at home. Where the thirteen stars were that once dominated the Great Seal that once represented the thirteen original states-there are now thirteen bullet holes, surrounded by barbed wire, as a reminder of what we actually export to those nations that we invade and occupy-under slogans about 'freedom & democracy.' In our 230 plus years as a nation, we have invaded other countries over 200 times. No nation on earth could be getting away with what Israel is doing now in Gaza-and even Israel could not be doing this without our approval and support. This 'permission' was clearly given by 531 members of the US Congress, with just four members in opposition, shortly after this Palestinian Holocaust began. Yes, Gaza is burning, but long after the phosphorus has consumed so much human flesh, and long after the fires have died down, the real flames which this invasion has ignited will continue to grow within the minds of millions, with an intensifying heat that may well mark the end of the savagely-barbaric "state" of Israel. Television news has declared a four day moratorium on any news of anything except Barack, or happy-jack regurgitations, so that the end of this blood fest might proceed without any further interruptions in an America that is determined to hold the anointment of their new Messiah, without the bloodshed or the horror that is Gaza today. What America isn't even close to realizing is that we here ARE exactly like the Palestinians: Their plight is what the future holds for us: but since so many cannot believe that anything that primitive could "ever happen here," we have simply returned to the safe and festive celebrations of the next dictator. But Obama is not different from Bush, as Barack will remain under their direct control, just as the drawing illustrates- this is not our country-we belong lock-stock and barrel to the Zionists in Israel. "Let me see if I understand this," wrote a friend in response to news reports that Israeli Prime Minister Olmert ordered President Bush from the podium where he was giving a speech to receive Israel's instructions about how the United States had to vote on the UN resolution. "On September 11th, President Bush is interrupted while reading a story to school children and told the World Trade Center had been hit--and he went on reading. Now, Olmert calls about a UN resolution when Bush is giving a speech and Bush leaves the stage to take the call. There exists no greater example of a master-servant relationship. Israel has also been playing at piracy on the high seas, turning back ships filled with aid in international waters, with threats of instant death to the crew members, or outright sinking of their boats if they had refused to immediately turn around and abandon their attempt to reach Gaza with assistance. When it comes to weaponry, beyond the modern arsenal we have given Israel, to make it the fourth largest military-power in the world: Now apparently Palestine is being turned into a weapons laboratory for the new and deadly in bizarre weaponry. DIME weapons are being used in Gaza. "There's a very strong suspicion I think that Gaza is now being used as a test laboratory for new weapons," Gilbert told reporters at Oslo's Gardermoen airport upon his return home on Monday. Dr. Gilbert said the kinds of injuries he and his colleague Erik Fosse had seen during their ten-day aid work in Gaza had proven that Dense Inert Metal Explosives (DIME) was being used in the embattled territory. Survivors close to the lethal range may have their limbs amputated as their soft tissues and bones are shredded to pieces. The victims may also subsequently contract cancer from the micro-shrapnel embedded in their body tissue within just four to six months. However the activists in 'Israeli's Against Zionism' have conducted a number of invasions and closures of Israeli Embassies, in Montreal and LA, as well as being involved in numerous other acts of civil disobedience in major cities aimed at trying to stop these Israeli war crimes. There is an active resistance among Israeli citizens that are outraged by what their nation is attempting to do to the world and the Palestinians in particular- which incidentally is more than Americans have attempted to do. "We" have allowed 531 members of congress to cheer this obscene bloodbath, while we continue to applaud while our new Messianic savior celebrates. There is so much collateral damage on the ground in Gaza, that Gaza City now looks like Beirut when Israel first invaded Lebanon on another of their crusades to kill the enemies of Israel that are apparently everywhere. However always it seems that their smart bombs miss, their cockpit crews fail to hit the military targets which they claim they're shooting at: And in the end whole cities are vaporized in the fallout from their phosphorus, their cluster bombs and rockets; and from DIME weaponry to whatever the latest torturous deadly weapons are, that the IDF is using on the Palestinians as guinea pigs for US weapons manufacturers and 'things' like the Lawrence Livermore labs. "The Palestinian Statistics Bureau is reporting Israel's assault has cost the Palestinian economy at least $1.4 billion. The bureau said 26,000 Gazans were unable to live in their homes and were being housed in temporary shelter. Much of Gaza's infrastructure lies in ruins. 20,000 residential buildings have been damaged; 4,000 have been destroyed." These numbers are vastly incomplete because Israel does not allow in the Red Cross, the Red Crescent, or the international aid organizations to aid the victims trapped in high rise buildings, or the blocks of homes and apartments that have been totally shattered, or completely destroyed: Hence there are no real casualty counts available. The story of how Israel planned for the total blackout of the world press in Gaza is in Amy Goodman's interview with Rashid Khalidi. Apparently the Israel's goal is to 'wrap-up-this problem' before the coming pomp and ceremony of Obama's coronation has run its course. 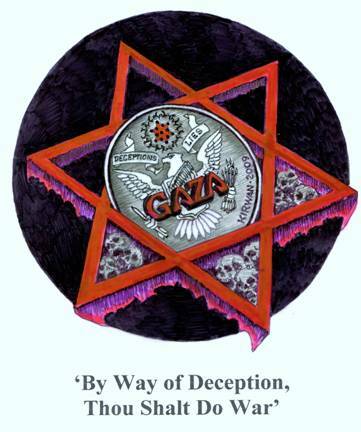 But the inauguration will only mark the real beginning of the depth of this sixty-year old problem, because the root causes are growing, and only a global solution will end these colonial occupations and illegal invasions that are at the core of life in too many parts of the world today, thanks to the Illuminati and the New World Order. While Gaza Burns the world has apparently turned her back upon these crimes against humanity and global- corruption in general. But this is not 'going away' anytime soon. In fact if we do not act this entire situation will soon be 'Coming to America," by which time there will be no one left to care because we have allowed this to happen to millions of people now, for far too many decades. . .
2) Israel turns Gaza into a Weapons testing lab?